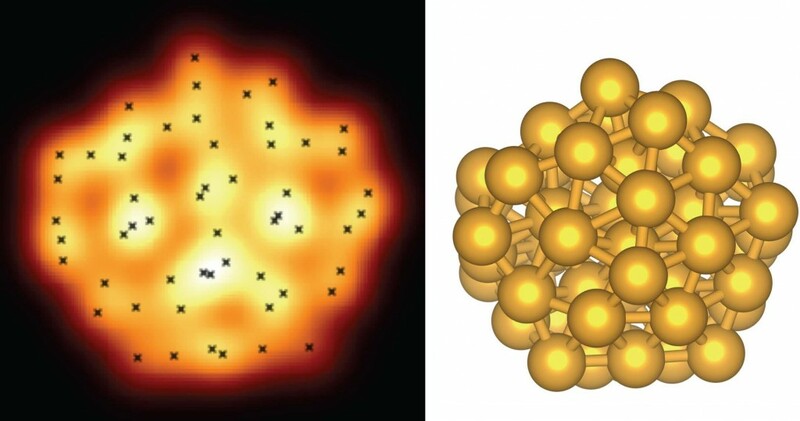 Determining the atomic structure of nanoclusters is a challenging task and a critical one for understanding their chemical and physical properties. Recently, the high resolution aberration corrected scanning transmission electron microscope (AC-STEM) technique has provided valuable information about such systems, but the analysis of the experimental images has typically been qualitative rather than quantitative. A method is presented for detailed analsis of AC-STEM images combined with theoretical modelling to extract atomic coordinates. An objective function formed by a linear combination of a fit to the two-dimensional AC-STEM image plus an estimate of the cluster’s energy for adding information about the third dimension is used in a global optimization algorithm to extract the atomic coordinates. The method is illustrated by analyzing model images generated for the Garzón structure of the Au55 cluster, which is a metastable structure for the embedded atom method (EAM) potential function used here to estimate the total energy. As the method does not rely on the alignment of atom rows in the AC-STEM image, the partially disordered chiral structure of the Au55 can successfully be determined even when a significant level of noise is added to the images. Keywords: nanocluster, AC-STEM, atomic structure, global optimization, genetic algorithm.